You may order this item; will ship when available. Mold consisting of a polycarbonate upper with strong magnets that cling to a removable flat stainless steel sheet (mirror finish) for the bottom. Each cavity 15 grams, 1-5/16 inch inch x 1-1/16 inch x 19/32 inch high (34mm x 27mm x 14mm high). Overall size of mold 5 inch x 11 inch. 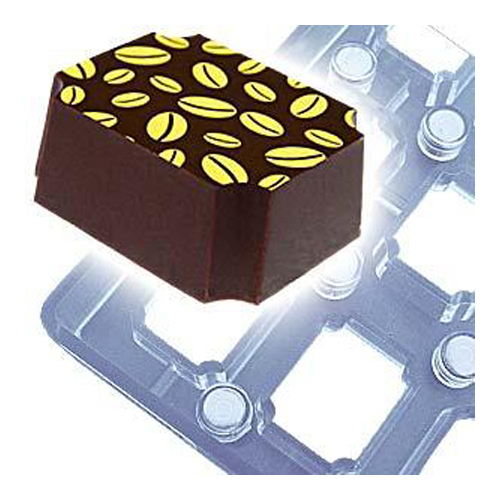 Create beautiful artisan-style signature chocolates with this incredible professional polycarbonate magnetic mold. Designed to provide outstanding detail that produces professional chocolates and candy. 2-piece mold held tightly together with commercial quality magnets. Create stunning chocolates by lining the bottom of the mold with a chocolate transfer sheet, place the 2 pieces together, and fill. Magnetic Molds Awesome molds. I highly recommend these molds. They are made very strong and so easy to use with chocolate transfer sheets. The chocolate came out perfect every time. Makes making gourmet chocolate quick and easy. Indented Corner Magnetic Mold I love the way these chocolates came out, and the process was really easy.